Clematis 'Roguchi' | Faddegon's Nursery, Inc.
May 25, 2016 | Perennials, What's New? ‘Roguchi’ has an interesting and charming history. It was bred in Japan by Kazushige Ozawa, a well-known clematis cultivator. He wanted to develop a flower that would be perfect for a tea ceremony which calls for one lone blossom to be present in the room. This is why ‘Roguchi’ is also known as the solitary flower. Clematis ‘Roguchi’ (sometimes spelled ‘Rooguchi’ or even ‘Rouguchi’) is surely becoming one of our favorite garden plants. The reasons are many. This lovely plant seems to fill numerous gaps that can nag at the gardener’s mind. Read on to find out why we love it. The color: ‘Roguchi’s’ black buds open to intense indigo-blue to plum color bells nodding on black stems. The edges of the bells show an icy lavender color. 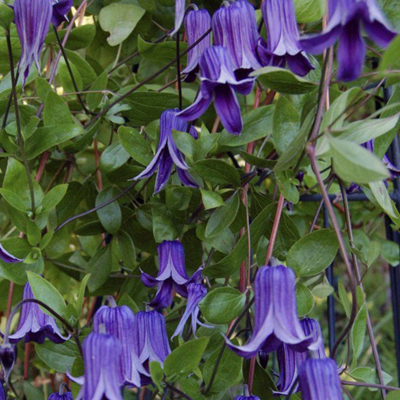 The flower form: The individual flowers are possibly the best of the bell-shaped clematis at 2½ long. They rise several inches above the foliage on long curved stems making them unbelievably graceful looking. The bloom season: This clematis begins blooming in May and continues right through September which has made it very popular. The ease of maintenance: Do you stay away from clematis because the pruning instructions seem difficult? Not to worry! ‘Roguchi’ doesn’t need pruning. Since it was bred from a bush type and a vining type, it behaves more like an herbaceous perennial, dying back to the ground in the fall and regrowing the next spring again full of buds. The hummingbirds: Pollinators will put ‘Roguchi’ on their menu quickly. And you’ll have flowers to offer all season. Hummingbirds can’t stay away! The size: Not a true twining vine, it will need some help to grow vertically to its full 6 to 8 feet of height. Tying to a trellis or fence will get it started in the right direction. Allow for a spread of 3-4 feet. The versatility: Although you can certainly train ‘Roguchi’ upward, left to its own devices it will find its way through and around other garden plants or shrubs creating a veritable river of blooms not exceeding 2 feet tall. Many gardeners find this an added value and plan the site accordingly. They can be lovely making their way through or around a rose bush or small Japanese maple. There is no limit to the combinations you can come up with. Like all clematis, plant ‘Roguchi’ where it can access full sun, but keep its roots cool. Plant in moist well-draining soil and feed with a slow release fertilizer during the blooming season.